If you’re like me, you have several seasonal wreaths, along with some holiday wreaths as well. But keeping those wreaths looking nice and new while in storage can be a challenge. The round, plastic storage cases sold at discount stores, (usually found after Christmas), work well, but are expensive, and can take up a lot of real estate. Especially if you are storing more than just a few wreaths. Plus, they usually come in one size only. 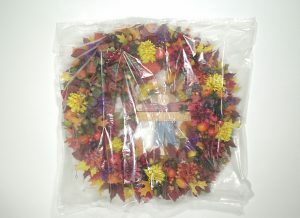 I personally store my wreaths in plastic bags, which protects them from dust, one of the worst offenders. Since all of Wreaths Unlimited’s wreaths come with cable ties for hanging, I simply cut a small slit in the middle of the top of the bag, and pull the cable tie through. You can either leave the bottom of the bag open, or roll the bottom of the bag up a few times, and tape it shut. The wreaths can then be hung in unused closets, from basement floor joists, attic rafters, wall pegs, etc. Note: If you don’t hang your wreaths from cable ties, you can still store them in bags, but they will have to be stored lying flat. Warning, the bag you choose should not be ‘too’ heavy, or it could weight down the wreath’s flowers or foliage, thereby disturbing the wreaths design. Leftover dry cleaning bags work great, they’re light weight and free. Just make sure the hole over the top of the wreath isn’t too large, or it will allow dust to filter in. The problem with dry cleaning bags however, can be their size. Many wreaths are simply too large for a bag that once held a shirt, or pair of trousers.